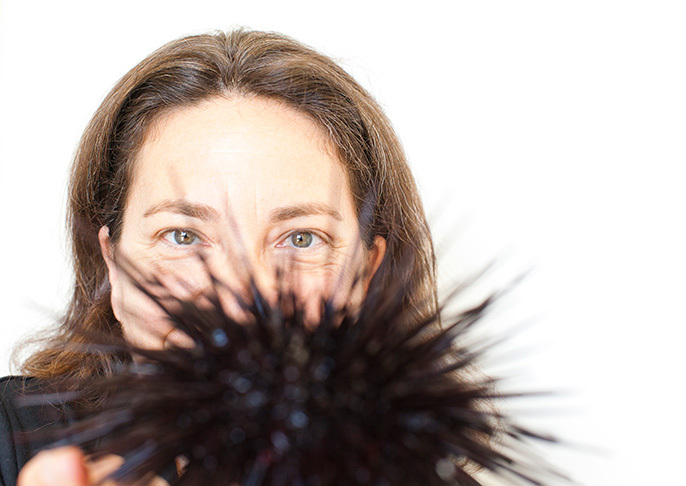 UC Santa Barbara champion Gretchen Hofmann carefully holds a sea urchin, one of the organisms affected by increasingly acidic oceans. The inaugural group of champions includes physicists, engineers, biologists, atmospheric scientists and others who have exhibited outstanding teaching, research and public service in the areas of climate change solutions, action and broad engagement. The recognition comes with a $25,000 award, to be used for a project during the academic year. Each project will involve students in a community-engaged research project. The program is designed to help meet and focus students’ interest in climate-action education, and to inspire other faculty members to help the university’s goal of achieving carbon neutrality by 2025 through engaged research and education. "If we can mobilize our students to start working toward solutions, they can be a source of innovative ideas for how to meet those goals," said UC Santa Cruz’s champion, physicist Sue Carter. All of the champions are devoted to working towards solutions to climate change, but they approach the issue from diverse angles. Some focus on scientific research, others on communication, others on cultural change, responding both to their own specialties as well as the interests of their students and local communities. UC Santa Barbara champion, marine biologist Gretchen Hofmann, noticed that her undergraduate students have been expressing more and more interest in understanding how anthropogenic change is altering the planet, and how this will affect them and their careers. “I’ve experienced this both in the classroom and in the requests from students who want to volunteer in my lab,” Hofmann said. Hofmann plans to engage undergraduates and create a team of outreach specialists on climate change issues that are important to the California coast, and work on additional ways to reach non-scientific audiences. UC Merced’s champion Michael Dawson plans to use his award to work with colleagues in other disciplines, undergraduate and graduate students, as well as local artists to explore different ways of presenting climate change data, both from the present and geologic history of California.